You can also use this rotor in most Shandon Cytospins with purchase of the Cytopro Adapter (AC-080). "Delivering textbook quality staining with trouble-free operation." The new Series 2 stainers fulfills Today's needs for Laboratories, with an easy and intuitive 21st century interface. The Aerospray Hematology Pro automated slide stainer is a necessity to any hematology laboratory because it can be adjusted to a wide range of staining requirements. The run time is short with slides ready for the microscope in five minutes giving superior results. Only fresh alchohol based reagent is applied as an atomized spray on slides mounted in a rotating carousel. Specimens contact only fresh stain, precisely metered from separate spray nozzles. Accuracy is assured. 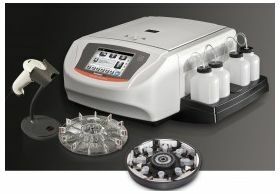 With the addition of the optional Cytopro® Cytocentrifuge Rotor, the Hematology Pro is also able to deposit cells onto microscope slides. The Aerospray Hematology Pro Series 2 automated slide stainer is a dual-purpose microprocessor-controlled slide staining and cell preparation system. The Aerospray Hematology Pro Slide Stainer/Cytocentrifuge combines ELITech's advanced staining technology with the advantage of alcohol based staining routines plus powerful custom staining options. With its rapid staining cycle and high throughput capability, the Aerospray Stainer is a convenient, cost-effective way to stain Hematology specimens. HOW IT WORKS: Reagents are applied from atomizing spray nozzles onto the slides. Staining is rapid and precise. Only fresh stain contacts specimens avoiding cross-contamination or contact with used reagents. Fixation can be done in the instrument or slides can be hand fixed. With the addition of the Cytopro rotor, body fluids can be processed in the stainer, making it a dual purpose instrument in one convenient footprint. DETAILS MAKE THE DIFFERENCE: Simultaneous contact by both dyes produces the classic staining patterns with superior, textbook quality results. The thiazin and eosin dyes are loaded separately onto the instrument to correct the reagent stability problems common to mixed stains. These stains are automatically combined and mixed prior to application to produce superior results.In fact, many customers purchase the Aerospray Pro just for its superior staining of bone marrow smears. SUPERIOR STAINING FLEXIBILITY: Aerospray offers a versatile selection of 9 different intensities for each of the 4 set programs: Rapid Wright-Giemsa, Wright-Giemsa, May-Grünwald Giemsa, and Custom Stain with simple adjustment routines to tailor the staining to individual preferences. 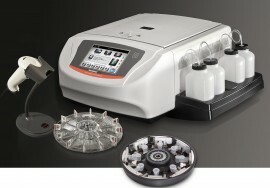 With the optional Cytopro®rotor, the Aerospray Stainer becomes a superb cytocentrifuge with eight-slide capacity and programmability, at a fraction of the cost of purchasing a stand-alone cytocentrifuge. A programmable function is also available for special staining requirements. Would you like to secure your settings with an administrator password? Do you want to be reminded to perform preventative maintenance or stain a QC slide? Just program the stainer as you like and the system will remind you. And don't worry about reagents and waste – the stainer alerts you to expired shelf life, or critical reagent or waste levels. Need to reinforce your QC management and ensure compliance with new lab requirements? The Hematology PRO series 2 memory stores critical information including: reagent data, specimen ID, user ID, and cycle operation history–all exportable via a USB port. The new bar-code scanner streamlines data entry, while manual keyboard entry is still an option. The Aerospray Hematology Pro Stainer is exceptionally sparing when it comes to reagent consumption. Programmability significantly reduces the volume of reagents required for staining partial loads and thereby significantly lowers reagent cost. With a cycle time as short as 5 minutes, the Aerospray Stainer can process more than 115 slides per hour (up to 288 with the optional 30-slide carousel). No more waiting for slides to dry–they're ready to view when the staining cycle ends. Simply select the user-defined program and start the stain cycle. The stainer takes over from there, precisely controlling all phases of the stain cycle with virtually perfect reproducibility. Automated nozzle clean and purge after each stain cycle ensures performance without user intervention.